It’s all proven and it’s available for a limited time at 70% off. Yes, I want to potentially add millions to my retirement starting with just $50 a month! I can ORDER NOW and SAVE 70%! 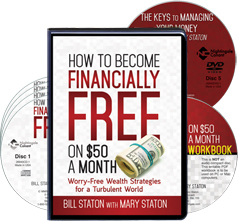 Please send me the complete How to Become Financially Free on $50 a Month program, including 4 CDs, a DVD, and the writable PDF workbook, for just $89.95 – which is 70% OFF the full retail price! Limited time offer!